PHILADELPHIA (WPVI) -- 3D printers are helping medicine in many ways. 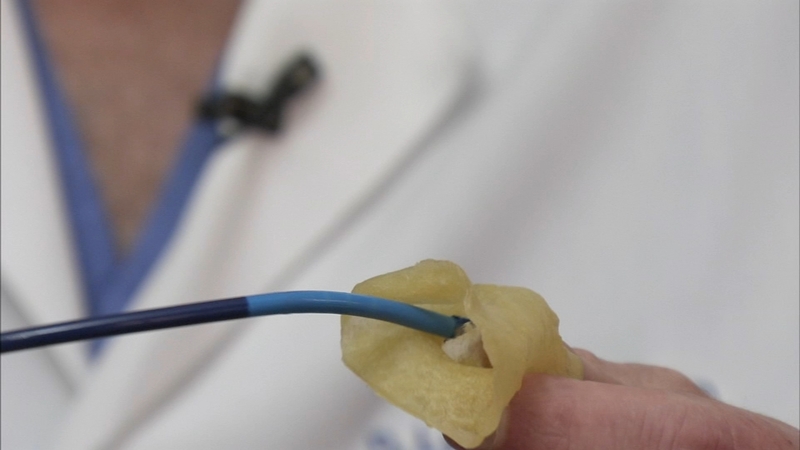 They're making prosthetic hands faster and cheaper and some Philadelphia doctors are using them to improve a treatment for a common heart problem. Over the past year or so, Doctors Gregg Pressman and Lynn Morris at Einstein Medical Center have implanted dozens of Watchman devices into patients with atrial fibrillation, or AFib. The small umbrella-like device fits into the appendage, a pocket inside the heart where blood clots can form and could trigger a stroke. "You want to make sure this appendage is totally closed with no leaks, so you don't get clots," said Dr. Morris. But the doctors say they kept running into a problem while implanting a Watchman. "Many times, the device size we thought would be appropriate was in fact not the correct size," said Dr. Pressman. So they'd have to remove one, and try another - meaning more cost and more time in the operating room. They say the conventional method of mapping of the appendage with echocardiograms wasn't precise enough, then they got an idea. "Perhaps creating a 3D print of the appendage would allow us to be more accurate," said Dr. Pressman. Information from CT scans of the heart is programmed into a 3-D printer. The actual print is rigid, so it gets coated with a soft latex to create a copy that flexes more like a real appendage. The doctors not only use the copy to check for size, but to plan the right angle for placement so the Watchman is secure. "Since we moved to 3D printing, we have had 100% accuracy in device sizing and placement," said Dr. Pressman. This has also helped to shorten the procedure time, which is helpful for vulnerable or frail patients. The doctors at Einstein recently published an article to share their technique with other experts. And more and more hospitals are starting to use 3D printers for all kinds of treatment.